Whew! Nine days in, and I can tell this is going to be one busy month…I think I’ve already spent 184.5673 hours of it watering my gardens. We broke a heat record on Monday and the plants have been practically scratching at my window, begging for a drink. This, when many parts of the world are suffering from flooding. I hope everyone affected is safe. I have a bunch of fascinating links to pass along this month – hope you enjoy these! National Geographic posted their winning images from their 2016 Travel Photographer of the Year contest – these are spectacular! This slideshow profiling wild tulips from all over the world is truly incredible – move through the link and click the arrow on the right hand side of the first page to get started on the flower photos. Even if you don’t have time to click on any of the other links I’ve given you today, take a couple of minutes to check this one out – you’ll understand why when you see it. Considering espaliering your fruit trees? Think BIGGER. Trees meet architecture in this photo compilation. Canada has been gifted with a gorgeous new tulip in advance of the 150 anniversary of Confederation, to be celebrated next year. ‘Canada 150’ is red and white, just like our flag. English artist Rebecca Louise Law exhibited another of her deconstructed flower arrangements in Berlin – what a way to celebrate spring! Here is a fascinating article about the origin of Canada’s most famous apple, the McIntosh. This is a candy terrarium. Yep, it’s edible. You won’t believe it, either. Annabel Pitcher – My Sister Lives on the Mantelpiece. And I’ve put up a recipe for a flourless Rhubarb Oatmeal Cake on Grit.com – you can use either fresh or frozen rhubarb for this one. And then top it off with a big mound of vanilla ice cream. Vanilla ice cream…the only way to deal with a heat record. Plus, if you get it served in a cone, you can water the garden while you eat. Win-win. Fairy Gardening Books – Giveaway Winners! Drumroll, please…it’s time to announce the winners of my Fairy Gardening Books Giveaway! Fairy Gardening 101 goes to Alys of Gardening Nirvana! Laurie from Notes from the Hinterland has won Fairy Gardening! Congratulations to you both! I hope you enjoy the books! Thank you to everyone for entering! Alys and Laurie, please let me know your mailing address via the “Contact Me” form on my blog (in the drop down menu below “About Me”), and I’ll get your books out to you in the next couple of days. Have a wonderful week, everyone! Happy gardening! Giveaway Winner Announcement – Shawna Coronado’s book Grow a Living Wall! The winner of a copy of Shawna Coronado‘s new book Grow a Living Wall is Boomdee! Congratulations! Boomdee, please let me know your mailing address (you can e-mail me directly using the form on my ‘Contact’ page) and I will get the book out to you this week! I hope you enjoy it! 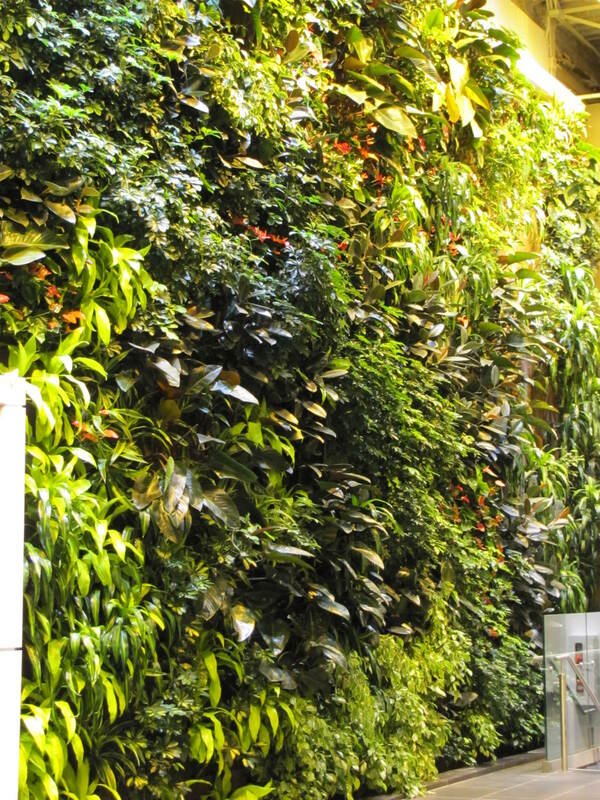 Thank you to everyone for participating in the giveaway – it was so great to read all of your comments and ideas for living walls. (And thank you once again to the publishers – Cool Springs Press/Quarto Publishing Group USA, Quayside Publishing Group – for the books!). 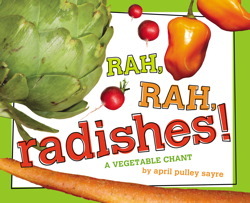 Book review: Rah, rah, radishes. I’m keeping my fingers crossed that I will get a share in a new CSA (Community Shared Agriculture) program getting underway this coming season – my mouth is watering just thinking of all the fresh, LOCAL produce that I will get every week (and my head is spinning trying to imagine how I will prepare them all in meals, especially given my meatatarian hubby’s “allergy” to veggies!). I’m thrilled that more and more of these CSA programs are becoming available for Albertans – especially for those of us who do not have the space to grow a significant amount of our own produce! Accompanied by absolutely STELLAR photography of all of the vegetables in their full, colourful glory, the book looks good enough to eat. It’s like a seed catalogue with a boppin’ soundtrack (and no confusing cultivar names). If you’ve got a little one in your life, introduce him or her to this book – and the exciting world of vegetables. Now, ‘scuse me, I’m off to make a recording of this book to play back while my hubby is sleeping…I’ll get him to eat kohlrabi somehow! Check out April Sayre’s veggie photos and more info at AprilSayre.com. (And watch for her fruit-themed picture book Go, Go, Grapes! in May of this year). Related posts: Book review: Water, Weed, and Wait. Book reviews for spring planning. Okay, so I may have drooled a little on this book – hopefully I won’t get fined for the damage when I return it to the library. It’s just that it’s so unbelievably pretty, you can’t help but ooh and ahh over all of the sumptuous photographs. I keep opening it, just to take a random gawk at the ‘Chioggia’ beets in cross-section, the ‘Japanese White Egg’ eggplants (which actually look like perfect white chicken eggs), or the beauteous purple-flowered ‘Di Sicilia Viletto’ cauliflower. Or what about feathery-leafed fennel ‘Zefa Fino’ or the potent brilliant orange ‘Fatali’ peppers, or the watermelon radish, with its bright white skin and “red meat” inside? 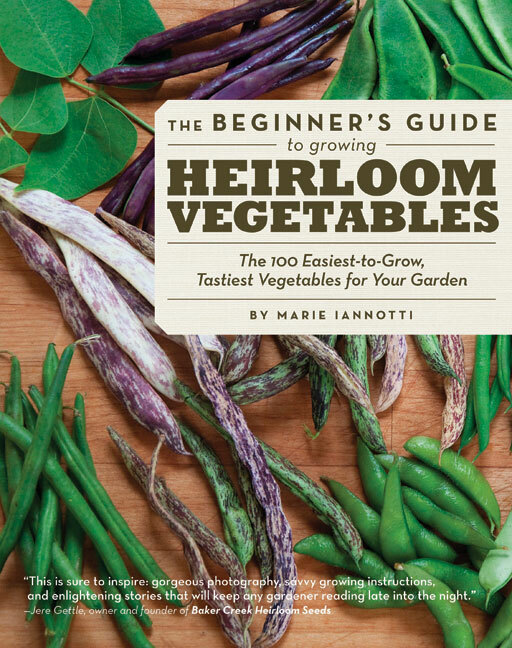 And although you could treat this as merely the world’s most tantalizing picture book, Iannotti gives you all the information you need to know to grow all of these wonderful vegetables, including what’s most important: how to save the seed and preserve these heirlooms for the future. Add to this the fantastic stories of the origins of some of these veggies and you’ve got my hands-down favourite gardening book of the season so far. 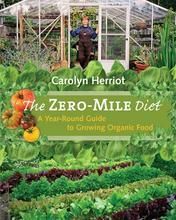 Okay, but then there is Carolyn Herriot’s The Zero-Mile Diet: A Year-Round Guide to Growing Organic Food (2010, Harbour Publishing, B.C.). Another book that is blissfully heavy on the seed-saving side of things (seed-saving methods are provided for every crop listed in the book – how amazing is that? ), The Zero-Mile Diet is seriously fun to pore through. While there are A-Z sections for veggies and herbs, there is also a large chapter devoted to fruit crops, and every inch of the book is loaded with extras: inspirational quotes, historical facts, food recipes (for humans AND for plants – did you know how to make a nutritious fertilizer from comfrey before this? ), cultural recommendations, charts and tables, and more photos than you could shake a stick at. Oh, and there are chicken and duck raising tips in here, too! As if that wasn’t enough, it’s all laid out to follow a year in the garden: what to plant and when, what to harvest and when – and while the West coast of Canada has a decidedly different climate than we do here on the Prairies, we can still use this template (we just have to compress it a little and move it ahead a few months. Okay, and we can’t grow everything. But we can dream!). The key word with this book is “sustainability” and there are examples of it in spades – it’s really a treasure trove of useful, practical information. 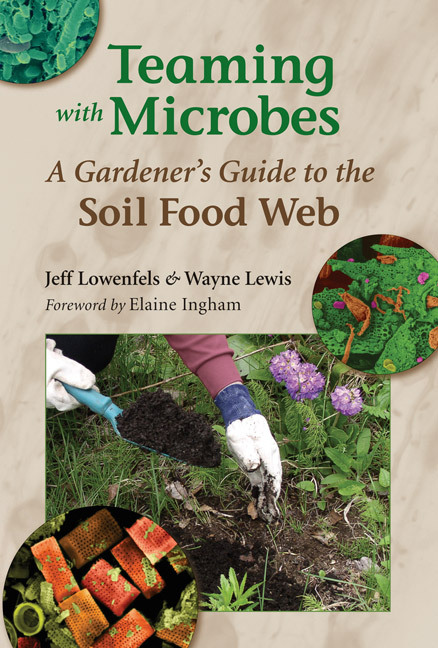 Hands down, one of the best books on the planet if you want to learn how to improve your soil organically and keep it healthy and viable for your plants is Jeff Lowenfels and Wayne Lewis’ Teaming with Microbes: The Organic Gardener’s Guide to the Soil Food Web (Revised Edition, 2010, Timber Press, Inc., Portland). While it’s a little textbook-y compared to the likes of Herriot and Iannotti’s books, it’s not about the glamourous side of gardening. Teaming with Microbes is all about what makes up garden soil, all the fungi and bacteria and mold and spores and critters that give the soil life – and in turn, help your plants take up moisture and nutrients so that they can thrive and produce. You want to know the science behind compost? It’s in this book. So is a marvelously detailed discussion of mycorrhizal fungi. And mulch. And leaf litter. And, most importantly, how to maintain a healthy lawn and garden just by understanding your soil and knowing what to contribute, and when, so that your plants get the best leg up. 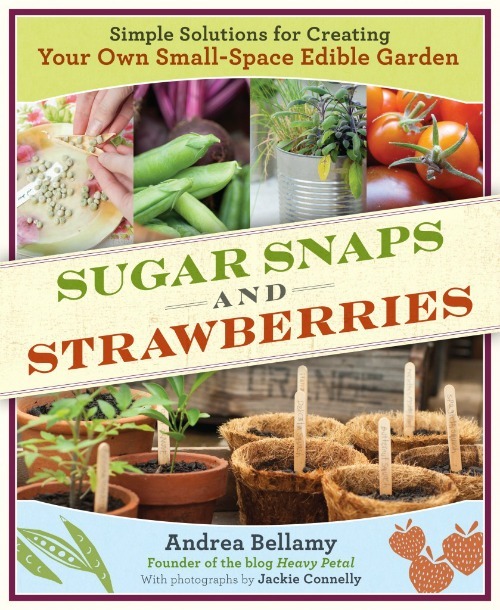 Book review: Sugar snaps and strawberries. This beautifully-photographed tome is a must-have for wannabe small-space urban gardeners: it’s a comprehensive how-to manual that details all of the necessities for creating an aesthetically-pleasing and highly productive food garden on a balcony, deck, courtyard, driveway, or small yard. Containers, of course, are the cornerstones of Bellamy’s designs, but she also offers construction plans for raised beds. All the gardening nuts and bolts are covered: light, water, soil, amendments, fertilizers, siting, pest control (organically, natch!) and all of the cultural requirements from sowing to pruning to harvest (including a really great section about saving seed and deliniating the terms “heirloom” and “hybrid”). About one third of the book is devoted to the food plants themselves, with brief, detailed portraits of standby greens, herbs, tomatoes, root veggies and small fruits – and some surprises, such as mushrooms and grains. I’m a bit astonished that Bellamy has included larger plants such as apples and corn on this list (particularly the latter, about which she writes, “Unfortunately, corn, also known as maize, is not suited to growing in very small places.” I’m not quite sure it belongs here, especially as she doesn’t mention that it can be grown as shoots, which may be more appropriate given the theme of the book. In her defense, though, a small yard can support a few corn plants, soooooo). 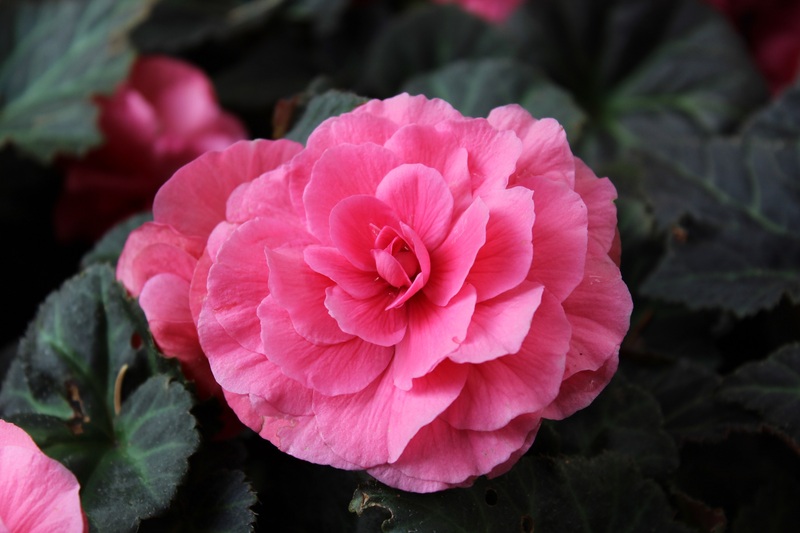 All in all, however, the plant selections are excellent small-space choices and many of them can be grown even in geographical locations with limited frost-free days. Written in a easy-going, very accessible manner (and as an aside, I LOVE the fonts and layout! ), this is THE primer for small-space gardeners looking to get started on their first food garden…it’s well worth purchasing as a reference tool. Bellamy is the creator of the blog Heavy Petal, which can be found here. Related posts: The Book of Little Hostas. How to Grow Your Food. 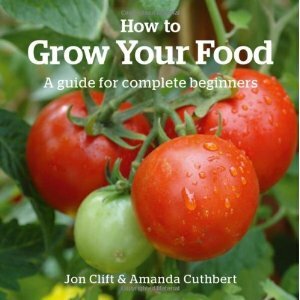 Book review: How to grow your food. 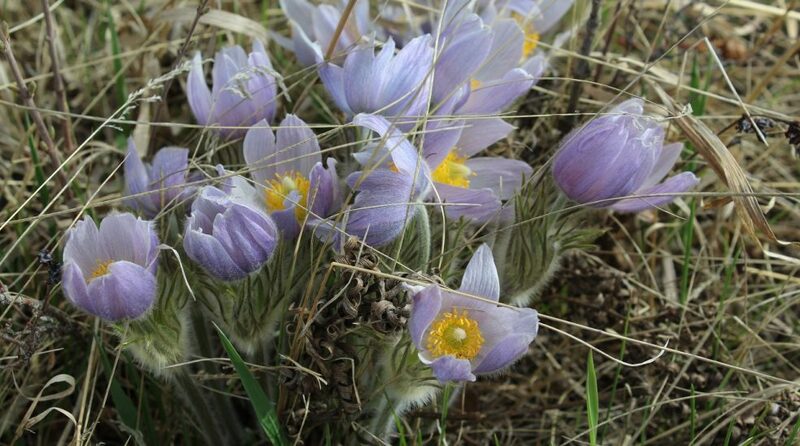 I know the gardening season has come to an end, at least for those of us on the Prairies (the snow is falling as I write, after all), but I believe you can never start soon enough with the dreaming. I mean, we have ten seven months of winter – what else can we do? Planning for next year’s garden takes longer than growing and harvesting the garden itself! If growing vegetables and fruit is new territory for you, but you’re dreaming of having your own fresh food next year, then Clift and Cuthbert’s book is perfect for you. This is about as basic as it gets, right down to the format of the book. It’s a very tiny, slender volume, with information about each plant on one side of the page and excellent, large photographs on the opposite page. Only one or two paragraphs are devoted to descriptions on how to grow, maintain and harvest each plant – this isn’t the place where you’re going to learn quirky facts or get bogged down by fancy cultivar names. Yet…it’s just the right amount of information for you to take with you to the garden centre when you buy your seeds in the spring, or to take to the garden plot after it’s been dug out and is ready to plant. You can grow veggies right away based on what is in this book – even if you’ve never put your hands in the dirt before. And, considering the book’s size, there are a lot of veggies, fruits, and herbs represented (forty in all): carrots, beets, zuchinni, garlic, onions, spinach, leeks, parsley, basil, currants, raspberries, rhubarb, potatoes, salad greens, even beansprouts. Even if you’re not a food garden newbie, there may be some plants you haven’t tried yet, and this book will give you sufficient direction. Track this book down and start dreaming! The photos alone will make you drool. And, if you have never grown vegetables or fruit before, do give it a try – you don’t need a huge garden plot, and a great many varieties can be grown in containers. Don’t get frightened by the traditional view of straight rows in a massive bed that takes up half the yard – that’s not necessary (unless you want it to be). With the high cost of food (and I mean that in more ways than one), it’s worth it to grow at least a few plants for yourself. You’ll be hooked.